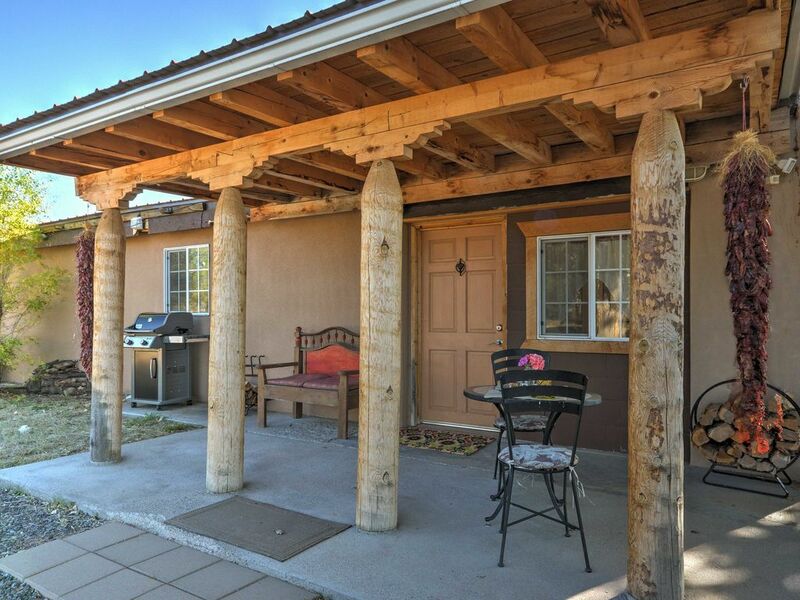 Breathtaking views of the Sangre de Christo mountains, dramatic sunsets, and starry night skies await at this 1-bed, 1-bath Santa Fe vacation rental that sits on a three-acre property, complete with a barn, corral and farm animals! Up to 4 guests can revel in days spent exploring the Southwest’s unabashed beauty before coming home to relax on the porch with a refreshment! This Southwestern-style home faces the back of the property, where you’ll find farm animals in the barn and corral about 250 feet from the Casita at the far end of the property. Feel free to walk around the farm during the day, where you’ll find 3 burros, 19 chickens, 6 ducks, and 2 goats - making this the perfect destination for all animal lovers! Inside, simple decor of local art and pottery, hardwood floors, and comfortable furnishings combine to create a homey environment to rest and unwind. Cuddle up on the living room couch as warmth pours in from the wood-burning stove and watch your favorite shows on the flat-screen cable TV. Outside, a quaint front portal with a bistro table and chairs is the perfect place to enjoy your morning coffee or tea. Later in the day, relax in the lawn chairs at the foot of towering cotton trees to enjoy a glass of wine and watch the breathtaking sunset reflected over the Sangre de Christo mountains. When you’re ready to retire for the night, the master bedroom’s cozy queen bed will provide a peaceful night of rest. The children or other adults in your party can enjoy a nice slumber on the queen-sized futon in the living room. This rural home is just 20 minutes from downtown Santa Fe, where you’ll find a multitude of activities to keep everyone entertained! Be sure to check out the world-renowned Santa Fe Opera House, explore The Cathedral Basilica of St. Francis of Assisi, or check out the Meow Wolf House of Eternal Return for a unique attraction featuring a wild new form of non-linear storytelling. And, a visit to the area would not be complete without a stroll on the famous Santa Fe Plaza, with its shops, quaint restaurants and local Native American artists’ offerings. Outdoor enthusiasts will find tons of places to hike and sightsee just a short drive from the property. Check out Taos, Bandalier National Monument, Chimayo, Nambe Falls, or Abiquiu, and be sure to bring your camera to capture these beautiful landscapes! When your need a break from cooking in the eat-in kitchen, experience some authentic Northern New Mexican Spanish cuisine at Gabriel’s, Rancho de Chimayo, or El Paragua! - Amenities include a fully equipped kitchen, air conditioning, ceiling fans, gas grill with propane, complimentary toiletries, in-unit washer and dryer, flat-screen cable TV, wood burning stove with firewood, free WiFi, furnished patio, outdoor dining area, and more! - Beautiful Santa Fe location - Enjoy easy access to hiking, biking, wildlife viewing, vineyards, restaurants, historical sights, museums, restaurants, and more! We have stayed many places on our various trips to Santa Fe. This location, was great. The casita was cozy with plenty of space for my husband, my son and his wife, and myself. We loved the animals. We have animals at home, so my son and his wife spent a lot of time petting the donkey's. I have a great picture of them petty each one. Thank you so much for allowing us to share your casita. Comfortable getaway with all the charm of New Mexico. It’s the perfect distance between Santa Fe and Taos! Pictures described property to a "T"
It was as cute as described. Owner, Leonardo, came by to greet us and showed us the farm. He also brought us tamales for Christmas and a pie the next day. Although it snowed we were still able to enjoy Santa Fe. We did bring our Aero bed for our adult daughter as futon there would not have been comfortable. Would love to return to do more exploring in the area. Thank you for a lovely visit. We had an amazing stay in this little casita. It was the perfect location for us as we traveled into Santa Fe and we explored some fantastic hikes, parks, wineries and the awesome Ojo Caliente springs. The casita was very neat and clean and had everything we could have needed. We never saw the owners, but we enjoyed visiting with the farm animals. I would highly recommend this vacation rental! The casita was well located about a half hour from Santa Fe, which meant there was plenty of room and dark skies to enjoy. Clean, good A/C and a wonderful collection of art and crafts on the walls and in niches. Owners were friendly and helpful. It's a farm with animals, but they worked hard to keep flies under control, and they were never a bother. We were on a 5 month camping trip so this was a great chance to clean out and clean up, while enjoying Santa Fe.only negatives I can think of are the absolutely killer speed bumps on the half mile road to the house. Drive slowly!